We’d love your help. Let us know what’s wrong with this preview of The Care and Feeding of a Pet Black Hole by Michelle Cuevas. A girl's friendship with a lonely black hole leads her to face her own sadness in this original, funny, and touching middle grade novel for fans ofCrenshaw andFlora & Ulysses. When eleven-year-old Stella Rodriguez shows up at NASA to request that her recording be included in Carl Sagan's Golden Record, something unexpected happens: A black hole follows her home, and se A girl's friendship with a lonely black hole leads her to face her own sadness in this original, funny, and touching middle grade novel for fans ofCrenshaw andFlora & Ulysses. When eleven-year-old Stella Rodriguez shows up at NASA to request that her recording be included in Carl Sagan's Golden Record, something unexpected happens: A black hole follows her home, and sets out to live in her house as a pet. The black hole swallows everything he touches, which is challenging to say the least but also turns out to be a convenient way to get rid of those items that Stella doesn't want around. Soon the ugly sweaters her aunt has made for her all disappear within the black hole, as does the smelly class hamster she's taking care of, and most important, all the reminders of her dead father that are just too painful to have around. To ask other readers questions about The Care and Feeding of a Pet Black Hole, please sign up. A sweet, humorous tale of grief, family & learning how to begin moving forward. About a year ago, Stella lost her father & up until this point, has refused to talk about it. (She hates when her little brother Cosmo brings him up; they are not supposed to talk about him.) She decides to give a recording of her father's laugh to be included in Carl Sagan's Golden Record because she doesn't want to have the painful reminder anymore. Only, when she comes back from NASA, she finds that a blac A sweet, humorous tale of grief, family & learning how to begin moving forward. About a year ago, Stella lost her father & up until this point, has refused to talk about it. (She hates when her little brother Cosmo brings him up; they are not supposed to talk about him.) She decides to give a recording of her father's laugh to be included in Carl Sagan's Golden Record because she doesn't want to have the painful reminder anymore. Only, when she comes back from NASA, she finds that a black hole has followed her home. This hole becomes Stella's 'pet'- & makes everything it touches disappear. Using this to her advantage, Stella feeds her pet all the things that remind her of her dad. She figures becoming numb is the way to go. But in doing this, she realizes that the good memories are being taken away as well. When Cosmos is sucked into the hole, it becomes clear that Stella is being consumed by her grief. In order to save her brother & herself, she must come to terms with all of the emotions she has been stuffing down for the past year. One of the funniest, most creative MG books I've read, but it's also got a heart made of the sad darkness of loss. Told in second person, Stella Rodriguez addresses her father who's passed away and from the very first paragraph, her dazzling prose drew me in. Plus, space and science! A great pairing with The Remarkable Journey of Charlie Price by Jen Maschari. I truly could not have loved this book more. Hilarious, creative, quirky, and totally filled my heartbroken soul. I might be in my 30s, but this helped heal me after the loss of my dad more than lots of “grown-up” books have. An incredible book that I can’t wait to share with both the little kids AND big kids who need it. “A person can’t just be the good parts. For a person to be a person, you hav I truly could not have loved this book more. Hilarious, creative, quirky, and totally filled my heartbroken soul. I might be in my 30s, but this helped heal me after the loss of my dad more than lots of “grown-up” books have. An incredible book that I can’t wait to share with both the little kids AND big kids who need it. “This sentence believes we ruin things if we try to make them last forever. “And I realized how much I missed you. And how much Cosmo missed you. And how much Cosmo needed me. And how much I needed him right back. It was everything I wanted it to be - scientific, funny, emotional, educational and relatable. I would give it all the stars in the universe if I could! As always, Michelle Cuevas left me a blubbering puddle of sobs on the train and the bus. I love, love, love her heart wrenching, redemptive words. The Care and Feeding of a Pet Black Hole is about a girl who unexpectedly finds a black hole while on her way home from NASA, and decides to keep it for a pet. But Stella has also recently lost her father, and her pet black hole becomes something oh so much more. The metaphor of grief as a black hole is such a simple, yet profound comparison. It both helps children understand an abstract concept, and gives those in the throes of grief something tangible to hold on to. A bonus? Stella is FUNNY. 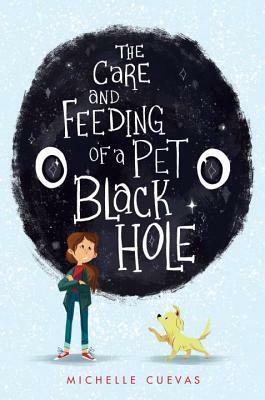 I The Care and Feeding of a Pet Black Hole is about a girl who unexpectedly finds a black hole while on her way home from NASA, and decides to keep it for a pet. But Stella has also recently lost her father, and her pet black hole becomes something oh so much more. The metaphor of grief as a black hole is such a simple, yet profound comparison. It both helps children understand an abstract concept, and gives those in the throes of grief something tangible to hold on to. A bonus? Stella is FUNNY. I loved her wit, her sass, and her skeptical, yet hopeful outlook. I can see myself giving this to students who have had a loss, in the hope that it will both help them understand a very difficult concept, and help them through their own grieving process. The only thing I wished was that we found out a little bit more about why Stella didn't have any friends, but I suppose that's a thought for another book. Adoro i libri per bambini, perché nascondo sempre un tesoro tra le loro pagine e anche alcuni pensano che solo perché c'è scritto che l'età di lettura va dai 9 anni in su non siano perfetti per gli adulti sono invece perfetti per tutte le età e hanno molto da insegnare a noi adulti. Il fantastico viaggio di Stella è un libro con una storia toccante, che sfiora il cuore del lettore, lo avvolge dolcemente e lo conduce all'interno della vita della piccola protagonista, gli mostra come una bimba di 1 Adoro i libri per bambini, perché nascondo sempre un tesoro tra le loro pagine e anche alcuni pensano che solo perché c'è scritto che l'età di lettura va dai 9 anni in su non siano perfetti per gli adulti sono invece perfetti per tutte le età e hanno molto da insegnare a noi adulti. Il fantastico viaggio di Stella è un libro con una storia toccante, che sfiora il cuore del lettore, lo avvolge dolcemente e lo conduce all'interno della vita della piccola protagonista, gli mostra come una bimba di 11 anni riesce piano piano ad accettare e soprattutto ad affrontare la perdita del padre. Stella si rivolge direttamente a suo padre, parla con lui, gli racconta cosa sta succedendo e qualche volta gli dice "Ti ricordi? ", gli confessa di aver tenuto solo ed unicamente per se alcune cose che facevo assieme, tenendo fuori sia la mamma che il piccolo Cosmo e pagina dopo pagina il lettore scopre l'immenso vuoto che vi è nella vita della protagonista, percepisce il suo dolore e in qualche modo finisce lui stesso dentro il piccolo buco nero, in viaggio con Stella e Cosmo verso i ricordi e l'accettazione della perdita subita. Nonostante sia un libro per bambini tutto è ben descritto e ben caratterizzato, la protagonista è ben delineata e per il lettore è facile riuscire ad immaginarsi ogni situazione ed ogni personaggio descritto. Un libro tenero, che con una narrazione semplice e divertente affronta un tema importante come la morte di un genitore. Michelle Cuevas ha uno stile narrativo pulito, lineare, che coinvolge il lettore, ne stuzzica la fantasia, lo commuove e lo fa sorridere, trasportandolo nel profondo dell'animo della protagonista, facendogli vivere ogni piccola situazione vissuta da Stella. In poche ore vi ritroverete alla fine del libro, avrete l'animo colmo dalle mille emozioni trasmette da questa fantastica storia, gli occhi umidi, ma il cuore leggero, non posso quindi che consigliarvi di leggere Il fantastico viaggio di Stella, ma ricordate sempre che si tratta di un libro per giovani lettori e dovete quindi affrontarlo con leggerezza e senza troppe pretese e in cambio vivrete una grande meravigliosa avventura. I didn’t know anything about the book when I first picked it up. What I thought would be a cute middle grade fantasy novel, turned out to be much more meaningful than I anticipated. It is a story about a girl dealing with grief after her father’s death. About how avoidance is not the best solution to your problems and how by trying to forget the bad things you inevitably let go of some of the good as well. If you can keep on and face the darkness, it will, in the end, take you where you need to go. It will take you back to yourself. as i expected, this was an emotional hell of ride. This is a story of loss, a road map to finding your new normal after a black hole hovers around you, and about accepting yourself--warts and all. I fell in love with every character in this book; again, this is an unusual discovery in a middle grade book and reason enough for me to put the young author, Michelle Cuevas, on my radar. And, hey! That space loving kiddo I told you about at the beginning? He's gonna eat this one up, but so will all the rest of my kids, too. Read this one immediately, folks! You won't be sorry. Highly recommended! My home was not a bathtub. My home was not in the depths of the blackest black hole. Was it like the crossword puzzles you used to love? In the puzzle called Home" would clues lead me to the answers? Bedroom. Kitchen. Garage. Swings. Table. Fresh. Baked. Cookies. Maybe home was more like a locket-a thing you kept close, and could share if you wanted, or could keep as your own secret. Or maybe it was more like the soles of old, beloved shoes, the middle of the sofa cushion, a worn path, a discolored poster, a cup ring on an old oak table. Something you see every day, and perhaps take for granted. I decided then that home was probably all of these things: something sought after, found, held close, used, well-worn, and best of all, familiar. I picked up an ARC of this book when I was at ALA. My 5 and a half year old wanted to read it when he saw it, and so we just finished it this week. He gave it an enthusiastic five stars, and I would tend to agree with him. I really enjoyed this book, it combines serious and silly, both taking seriously the loss of a parent, while keeping it tonally appropriate for younger kids. I would consider it excellent read for children who have lost parents, or for children who have friends who might have, I picked up an ARC of this book when I was at ALA. My 5 and a half year old wanted to read it when he saw it, and so we just finished it this week. He gave it an enthusiastic five stars, and I would tend to agree with him. I really enjoyed this book, it combines serious and silly, both taking seriously the loss of a parent, while keeping it tonally appropriate for younger kids. I would consider it excellent read for children who have lost parents, or for children who have friends who might have, allowing opportunity for conversation about what loss might look like for different people. It's touching and emotional in places, and silly and light-hearted in others, but that combination works beautifully, because that's how grief frequently works, the heart-breaking and the ridiculous can find themselves matched up in your experience. I chose to read it aloud to my five year old because he is a fairly sophisticated reader, and we had opportunity to speak to it, in general were I handing it to a child I knew less well I would say probably somewhere between the 8-9 years of age mark. Larry, the pet black hole is named after his singularity or gravitational center and is eating his feelings. Anything he touches gets absorbed into his core and he wants to snuggle with soft, furry things the most. There goes Stinky Stu, the classroom hamster and later The Dog With No Name. Our protagonist, Stella, launches an expedition to recover their puppy and her brother Cosmos is inadvertently sucked in with her. As they plumb the depths of the black hole that is Larry, they renew their rel Larry, the pet black hole is named after his singularity or gravitational center and is eating his feelings. Anything he touches gets absorbed into his core and he wants to snuggle with soft, furry things the most. There goes Stinky Stu, the classroom hamster and later The Dog With No Name. Our protagonist, Stella, launches an expedition to recover their puppy and her brother Cosmos is inadvertently sucked in with her. As they plumb the depths of the black hole that is Larry, they renew their relationship and learn to grieve over their lost father together. Stella also is finally able to admit that without her dad there is a hole in her life and has several other epiphanies along the way which I will not reveal to avoid spoilers. This is one of those few delightful children's books that manages to, through the magic of excellent writing, portray a child character who is astute, yet not pretentious, witty, yet not bratty, introspective, yet not whiny, and gets involved in a storyline that is silly, fun, and ridiculous, AND serious, sad, and thought-provoking all at once. In short, this thin volume has everything either a child or an adult could possibly want in a great book. I'm a fan for life, Michelle Cuevas! PS- Highly This is one of those few delightful children's books that manages to, through the magic of excellent writing, portray a child character who is astute, yet not pretentious, witty, yet not bratty, introspective, yet not whiny, and gets involved in a storyline that is silly, fun, and ridiculous, AND serious, sad, and thought-provoking all at once. In short, this thin volume has everything either a child or an adult could possibly want in a great book. I'm a fan for life, Michelle Cuevas! Hmmm... Gak jelek, tapi juga gak akan masuk daftar buku anak favorit saya. Premis awalnya bikin saya kepincut: anak perempuan punya peliharaan black hole. Tapi, konklusi di akhir bikin saya agak kecewa karena jelas-jelas ini merupakan pemfiksian pengalaman pengarang kehilangan sang ayah (angkat?). Memfiksikan pengalaman yang pernah benar-benar terjadi pada diri pengarang memang bukan sesuatu yang buruk atau salah. Jauh dari itu malah. Justru pengalaman merupakan sumber ide utama bagi penulis, term Hmmm... Gak jelek, tapi juga gak akan masuk daftar buku anak favorit saya. Memfiksikan pengalaman yang pernah benar-benar terjadi pada diri pengarang memang bukan sesuatu yang buruk atau salah. Jauh dari itu malah. Justru pengalaman merupakan sumber ide utama bagi penulis, termasuk saya. Tapi... Novel ini semakin ke belakang semakin terasa "curhat". Tokoh Stella jadi kehilangan orisinalitasnya akibat intervensi pengarang di dalam karakternya terlalu besar. Stella yang mestinya masih bocah, jadi terasa dewasa akibat pengarang yang terlalu ikut campur. Dulu saya pun pernah mendapat kritikan semacam ini, barulah saya menyadarinya begitu saya berada di posisi pembaca alih-alih penulis. Sebagai pembaca, saya ingin membaca "cerita", bukan curhatan kesedihan pengarang yang diberi topeng "fiksi". Gross humor in a book with a female main character, YAY! A sweet story, and very wise. Read to me by my dd11. Made me cry. I loooooooved this book! So smart, funny and heartbreaking. This book is a Pixar movie in novel form. It's imaginative, funny, and tear-jerking. My husband only started listening to it halfway through, and he cried even more than I did at the end. The audiobook version of this is SUPERB, by the way! Wonderfully imaginative. Even though there is much sadness, there is also a lot of humor. A modern take on Alice in Wonderland. You will fall in lover with the characters. This a beautiful children's book about loss snd grief. I wish I had had it when my father passed away. It is insightful and adorable. Interesting story about grief, family, and getting back to the task of living. Stella is a realistic character - even if the black hole that follows her home may not be. She is consumed by grief and it isn't until her brother and dog are consumed as well that she starts to climb back out. Would make a good read aloud and would also be good for students who may not know they are grieving. This book was filled with humor, puns, a girl who wants to work for NASA, and a brother who loves his bath toy. This story is a metaphor for grief that is written in such an engaging way, the reader will be too busy enjoying the adventure to realize how much they're learning along the way. I'd recommend this book to anyone who has lived with a black hole in their lives, as it teaches that grieving doesn't have to be done alone. I believe this book would be especially helpful to middle grade child This book was filled with humor, puns, a girl who wants to work for NASA, and a brother who loves his bath toy. I read this in one sitting; Stella's voice pulled me right in. So much creativity, humor, and pathos rolled into one well-written, interesting book. Loved the constellations like Ice-Cream Conius and Jar of Fireflies; the gnome names like Zoomwinkle and Pimpert; Stella's realizations like "I could see that Mrs. Nimbus wasn't just crazy, but that she was sad"; the black pages when she jumps into the black hole; the Brussels sprouts; the river of words ... so much good stuff. p. 80: "A person can' I read this in one sitting; Stella's voice pulled me right in. So much creativity, humor, and pathos rolled into one well-written, interesting book. Loved the constellations like Ice-Cream Conius and Jar of Fireflies; the gnome names like Zoomwinkle and Pimpert; Stella's realizations like "I could see that Mrs. Nimbus wasn't just crazy, but that she was sad"; the black pages when she jumps into the black hole; the Brussels sprouts; the river of words ... so much good stuff. Cute, but so woefully wrong scientifically that it's difficult to recommend. I got the analogy and that this wasn't a real black hole but still! Michelle Cuevas was born in 1982 in Berkshire County, Massachusetts. She graduated from Williams College and holds a master of fine arts in creative writing from the University of Virginia, where she received the Henry Hoyns Fellowship. 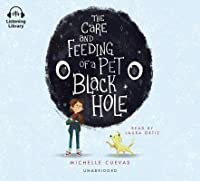 Michelle is the author of The Care and Feeding of a Pet Black Hole, Smoot: A Rebellious Shadow illustrated by Sydney Smith, national bestseller The Uncorker of Michelle Cuevas was born in 1982 in Berkshire County, Massachusetts. She graduated from Williams College and holds a master of fine arts in creative writing from the University of Virginia, where she received the Henry Hoyns Fellowship. Michelle is the author of The Care and Feeding of a Pet Black Hole, Smoot: A Rebellious Shadow illustrated by Sydney Smith, national bestseller The Uncorker of Ocean Bottles illustrated by Caldecott medalist Erin E. Stead, Confessions of an Imaginary Friend, Beyond the Laughing Sky illustrated by Julie Morstad, and The Masterwork of a Painting Elephant illustrated by Ed Young. Forthcoming in 2018 is The Town of Turtle illustrated by Catia Chien, about a turtle doing some big renovations on his shell. Her 2017 title The Care and Feeding of a Pet Black Hole was optioned by Fox Animation/Matt Reeves, and her 2015 title Confessions of an Imaginary Friend is being developed into an animated feature film by Fox Blue Sky. Her books have been translated into over 20 languages worldwide. Her hobbies include watercolor painting, drawing, learning the banjo, and being mom to a Bernese Mountain Dog named Indy. Some of her favorite books are The Velveteen Rabbit, The Giving Tree, Charlotte's Web, Le Petit Prince, To Kill a Mockingbird, and poetry collections by Shel Silverstein, James Tate, and Mary Oliver.